Home » Miniature Donkeys » Building Shelter for Miniature Donkeys or Goats. 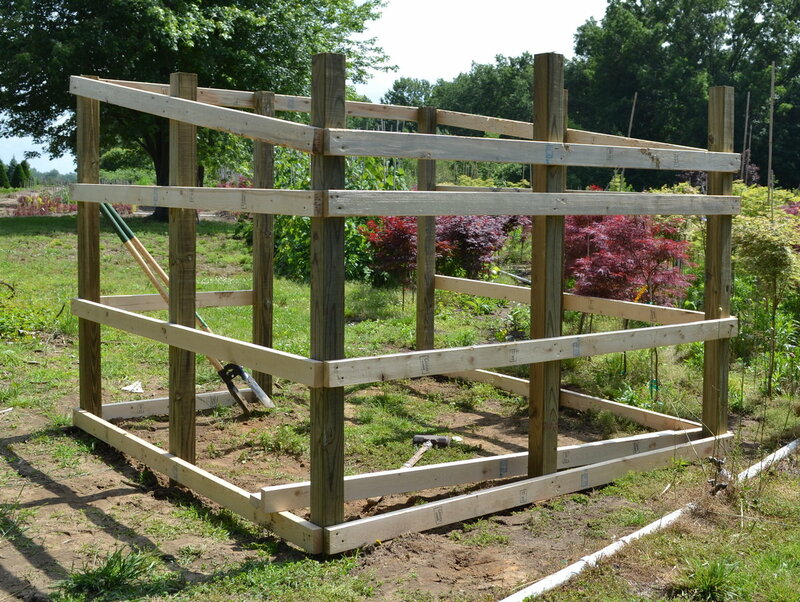 Building Shelter for Miniature Donkeys or Goats. I’ve got these two Irish Miniature Donkeys that I just bought and I need to build for them some kind of a shelter house or small barn so I thought that I would document the process so maybe somebody some where, some day might benefit from my efforts. How do I know that my Miniature Donkeys are Irish? Because we’ve given them Irish names! I asked my subscribers for help with that and we got a ton of great suggestions, take a peek and meet the donkeys. Building Shelter for My Miniature Donkeys. The start of a miniature donkey shelter house. When I built the donkey shelter shown on this page I didn’t anticipate a winter with temps of -15 degrees F. That’s way below zero! They did okay but I was concerned and promised them a warmer house come spring. Here are their New Digs, Much, Much Warmer! I know that you are going to ask me for the plans, but there are no plans. I started with an idea of what I would do and pretty much went into “wing it” mode from there. I’m not much of a carpenter so you can critique this all you want, I did the best I know how. First thing I did was lay out the foundation with mason’s line to establish the size and get it as square as possible. My donkey shelter is approximately 8′ by 8′. Might be off a tad. Actually I think I made it 96″ by 93″ and it would have been easier if I had made it 92″ by 92″ since the materials are all 96″ in length, but the overall size gets a little wider as you add materials to the outside of your posts. When you lay out the foundation with the mason’s line, make sure you extend the string and pins well beyond the actual dimensions, that way you don’t disturb the pins as you dig and work. Miniature Donkey Shelter House Under Construction. 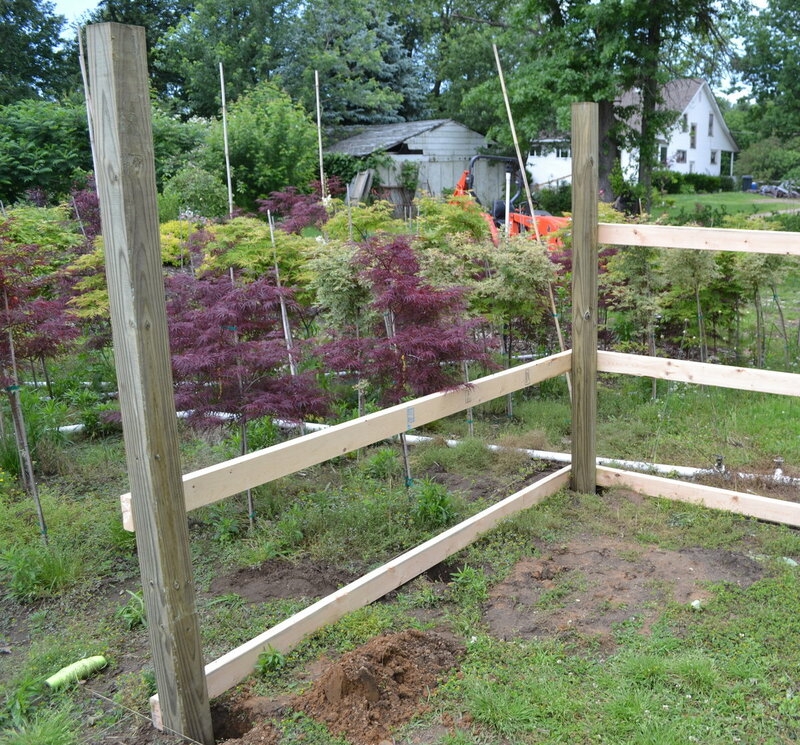 Using the same idea behind a pole building I used treated 4″ by 4″ by 8′ posts for my uprights. With a post hole digger I put them about 24″ into the ground. Then added 2″ by 4″ purlins around the outside for support and to give me something to attach the T1-11 siding to. Joist Hanger for the Roof Supports. I used these joist hangers to support the 2 by 4’s that will support the roof joists. The roof line with the joists in place. Is this strong enough to support a heavy snow load? I hope so. Since I’ll be out there everyday to feed and water the Miniature Donkeys I can clear snow from the roof when it becomes necessary. T1-11 siding going on the miniature donkey shelter house. This Miniature Donkey Shelter House faces south east but is open in the front so the donkeys can come and go as they please. I’m new to the world of miniature donkeys so all I can do is take advice from those with more experience than I have. They tell me to not close up the house, leave an opening so the donkeys can go inside during storms or extremely cold weather. I am told the prefer to be outside most of the time. With years of experience in the Nursery Business I know that the lower the structure, the warmer the structure, so at the front my miniature donkey shelter house is 6′ high and slopes down to 5′ high in the back. I am also very aware of the natural heat from the ground so I opted not to put a wooden floor in this structure. A wooden floor would allow cold air to get below the floor keeping the shelter colder than it need be. Looking at the above photo you can see the 2 by 4 along the bottom. What I am going to do is actually remove a little soil from under the 2 by 4 and allow some air flow under the siding during the summer months, then come fall I’ll just put soil or mulch around the base to eliminate that air flow sealing it up for the winter. Come spring I’ll remove that soil. I know that sounds crazy but I’ve got a Huge Pile of Potting Soil just a few feet away from the Donkey House so placing and removing the soil is not a problem. Inside the Donkey House on the floor I’ll put heavy rubber stall mats. You can get them from Tractor Supply. The inside of the miniature donkey shelter house. 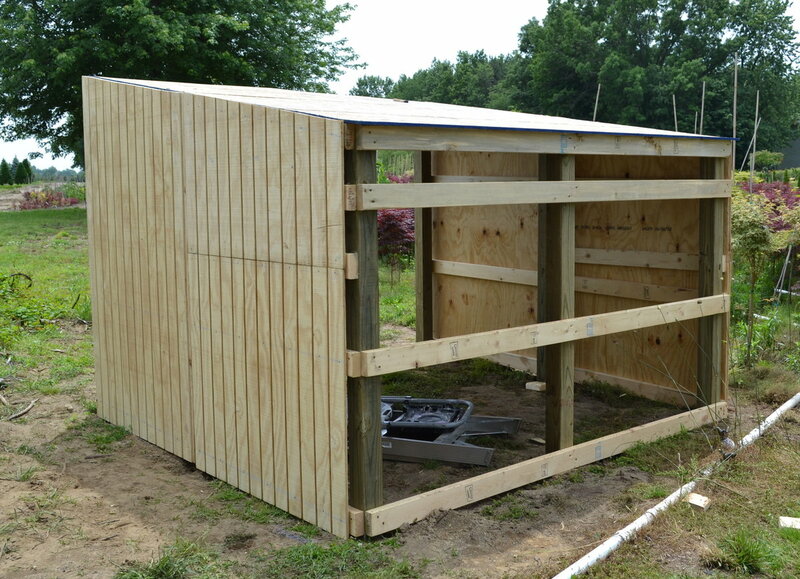 I lined the inside of the Donkey Shelter with 7/16″ OSB Sheathing for two reasons. Lining the inside of the shelter with sheathing creates an air space between the T1-11 siding on the outside and the sheathing on the inside. This air space will help to insulate the shelter keeping warm air in and cold air out. Keep in mind, the front of the shelter has a large opening, so it can only be so warm, but in some ways it reminds me of an igloo built into a snow bank. It might be cold, but it’s more comfortable than being out in the wet weather and the wind. Miniature Donkeys like to gnaw on wood so hopefully the sheathing will deter that a little. It also covers up the treated wooden 4 by 4’s. I’m told that treated wood can and will make the donkeys sick. Some claim not, but many veterinarians claim that it will. From the side you can see the slope of the roof. At the back corner you can also see the gap on the corners. Before the shingles went on I trimmed out the Donkey Shelter with 1″ by 4″ or 1″ by 6″ boards to seal up the corners. Putting felt paper and shingles on the donkey shelter house. My 85 year old father-in-law helped me build the donkey house. It was hot so we donned our summer hats! It does him a world of good to do something with his hands. He loves helping with projects like this. And of course having his expertise around is also a huge help. In this photo you can see the 1 by 4’s that I used as trim. Then we made a Miniature Donkey Shelter video to show off the finished product. It ain’t perfect, but the donkeys don’t care as long as breakfast and dinner are served on time. Today they have a Semi Underground Bedroom! Check it out! The Donkey House is done! Pruning Small Plants as You Grow them to Make them Nice and Full, not Lanky. Great information, thanks. I’m going to use your plan for my Goat shelter. It look simple and quick to build and about the size I need for 2 or 3 goats. Please may you list the supplies and wood you used to build this shelter as it looks fab and I would love to build one myself . I have no idea, it’s about 8′ by 8′ that should give you a place to start. Is it legal to have a mini donkey in Houston TX? You’d have to check local zoning but if you are right in Houston I’m guessing not. Move out to Willis or Spring, the zoning looks more relaxed there to me. How much acreage does two minis need for grazing. Am starting from scratch. Need fencing, electricity for heated water, water line, shed, etc? We live in Northern I’ll. So weather can be brutal here. Just came across your video on youtube. I’m getting 2 Nigerian Dwarf Goats and have been racking my brain on a shelter for them. I LOVE this shelter and this has given me the idea of what I want. I really really want a couple of mini donkeys, but the goats will be fine for now. We just built this today with a just a few verriations. My cost was about $700. Thank you for posting this is was a huge help. Honestly the hardest part was getting the posts in square. But after that it was smooth sailing. You’re welcome, enjoy your new friends. You are wonderful. I like your miniature donkey shelter. Can you tell me how much the wood cost you so I will know what I’m looking at. I have looked with much interest at the shelter you have designed. It looks great by the way. I am going to build one for a small Donkey that I have recently become the owner of. Your pictures and video have given me a good base to start from as I was unsure how to begin and did not want to make mistakes. Thanks for the kind comments. I would suggest double walls like I did and insulating between them. Wish I had done that. Had no idea it would get to 15 degrees F. below zero but it did. Donkeys did fine, but I’m sure it wasn’t much fun for them. Next winter I’ll make some changes. Hi Mike, love the shelter. I was wondering about the insulation as we live in Minnesota and winters can be brutal with temps at night in the negative 20s! What sort of insulation would be best between the walls? And any suggestions for a more permanent door? I feel they will need that in the winter. Also does anyone have suggestions for helping keep the deer fly off those little guys. I dont even have mine here until November but the deer fly are awful where we live and I’m concerned for them. There is no spray for humans that helps so I figure there isn’t for donkeys either. I spray the boys with Equine spray, mostly on their legs, that’s where the flies bother them the most. Insulation? Absolutely! 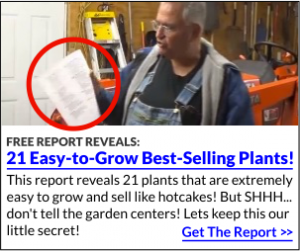 I should have done that and now I’m going to build them a shelter that is at least 24″ below grade to capture ground heat and the shelter will be built into a soil, brush pile for extra insulation. We did fine last winter, but it was really cold here and I worried about them. They stayed healthy, but it was cold. During the winter I closed in the large opening with a door on hinges, but an opening just big enough for them to go through, then put a blanket over that to trap in heat. Keep in mind, the smaller the shed, the more they can heat it with their body heat. Remind me to share their new home as I build it, probably later in August. This one will really be designed much like an igloo. Super excited to see your new “Igloo” because I think that is what we will need as well. I’ve read you can put a blanket over them when its cold. Do they keep it on? I get to go meet my 2 babies tomorrow, I’m super excited! Any suggestions for the heated water bowl? I have a heated water bucket from Tractor Supply, works great. I have done blankets. Lots and lots of straw and they were never wet or shivering. This winter I’m pretty sure they will be quite comfy. We have had great luck with a product called Celebration a package of three or four tubes used topically. This is perfect! We have a sweet little mini horse as an addition to our farmette, and I want to build something by myself. I think I can do this! Girl Power!!! Thanks so much for sharing your project! Notice that I put paneling on the inside. I suggest you insulate this as well depending on where you live. For the winter I put up a door with an opening just big enough for the donkeys to get through. How much did it all cost? I’m thinking of getting goats. Sue, great question. I almost bought an 8′ by 8′ shed kit for $990 but decided to build this instead. Price came out to just about the same, right around $1,000. Nice Job Mike. I’m a chippy and I can honestly say you’re a better one than many I’ve had to work with. As for the preservatives, I’ve seen them that are said to be animal safe, but I’d play on the safe side and do just as you’ve done. It’s far better to have to replace timber than pay out expensive vet bills for sick animals. I’d love to have a couple but alas no room. Thanks for sharing. We enjoyed reading and seeing your ideas for our goat shelter. We are trying to figure out if we should even treat our wood. Hmmm. the little donkeys should be happy happy happy!